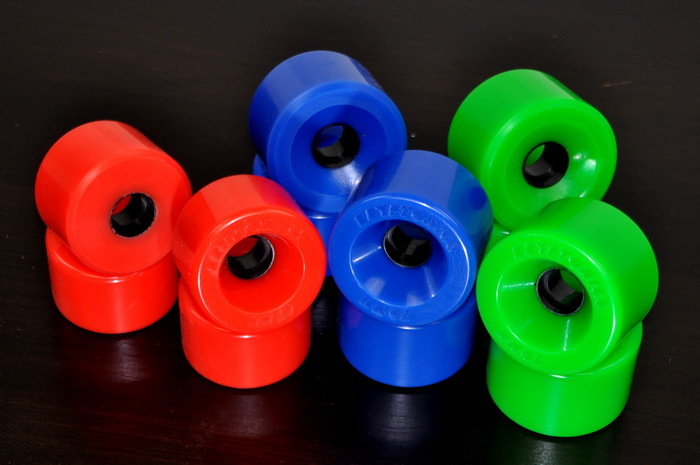 The crew over at SILVERFISHLONGBOARDING.COM just posted a new in depth product review for our Star Trac Wheels! Sounds like they are just as stoked as we are about these wheels! Read the full review below or jump over to their site here to check it out. Okay, to start this whole this off, we built-up a few retro boards that might have been rolling Kryptos back in the day. A pig with Tracker Full Tracks (Dart version) went straight to the skate park with 82a blues on it, the 86a greens went on a burly 42” pin with Randal DH’s and the most anticipated wheel of them all, the 78a reds, went onto an old Fibreflex. The next part was easy: skate ‘em in the park, find a ramp, bomb some hills and cruise the streets…you know, skateboarding! We even pulled some 70’s and 80’s-issue Kryptos off the display boards at the Silverfish offices to compare on the same boards. The initial responses from skaters on the crew were very positive: “…great feel and a fast roll!” “These greens are faster than my old ones ever were!” “So smooth in the snake run!” Clearly, these aren't just cheap wheels poured to cash-in on an old marquee. Our lighter thrashers seemed to prefer the blue Star*Tracs above the other two duros, but two elements of our crew rated them below either the red or greens in terms of preference. First come the OG dudes who were looking for the high-rebound 86a blues they remembered, “(t)hese don’t feel like a perfect blue Krypto”. Well, sure: four durometer points this low in the range is a big difference and those guys turned out to love the greenies, discussed below. Then come the more aggressive sliders, who also prefer the salad-colored wheels. Finally, the retro-guys and dedicated cruisers looking for either a period-correct wheel or the classic soft, fast ride just prefer the reds. We can’t fault that. New 55mm Star Trac Wheels!